The Wingham Carder is dispatched with Free Shipping to UK destinations and comes with a £15 Wingham Fibre Voucher. 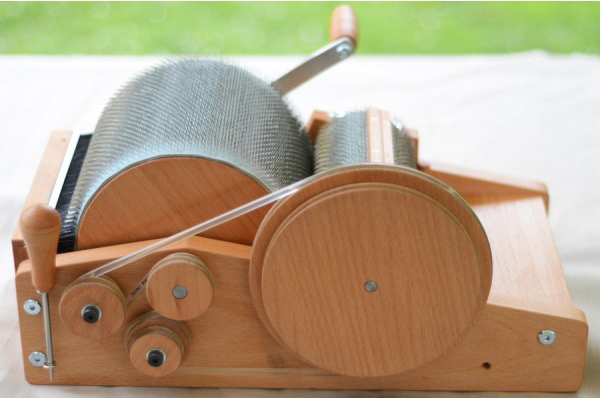 The Wingham Drum carder is designed by us and built right here on site, allowing us to create a piece of equipment that has all the features we consider to be the most important. We think that our carder is excellent value without compromising on either materials or build quality. 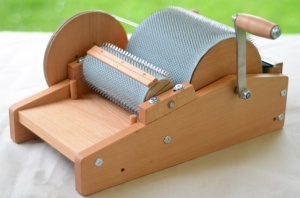 The card cloth is 72 points per inch (PPI) stainless steel, the same grade as our Wingham Hand Carders. Coarser and finer grades are available, but the 72 PPI is a good balance for the vast majority of fibres that will be used. 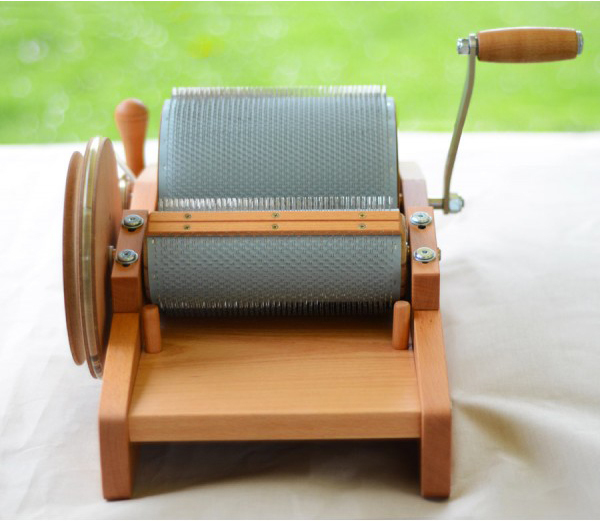 It takes very heavy use to wear out card cloth and its not something we see often, you'll be using this carder for many years to come. We don't glue the cloth to the drums, making it easy to replace if required in the future. 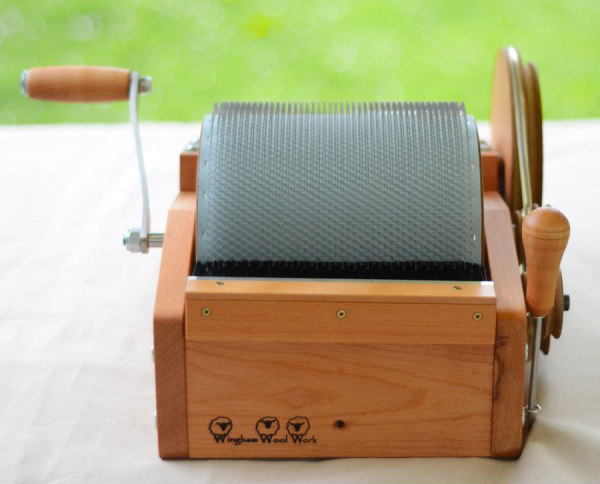 The main drum measures 20cm (8") in width and has a diameter of 18cm (7"). This means that your final carded batt will be approximately 56cm (22")long. The frame is hand-made from certified sustainable European beech finished in Danish oil. The side panels are fixed with machine screws and barrel nuts. More secure than screws and easier to take apart for cleaning. All rotating shafts are set in Oilite self lubricating sintered bronze bearings. High speed machine quality. 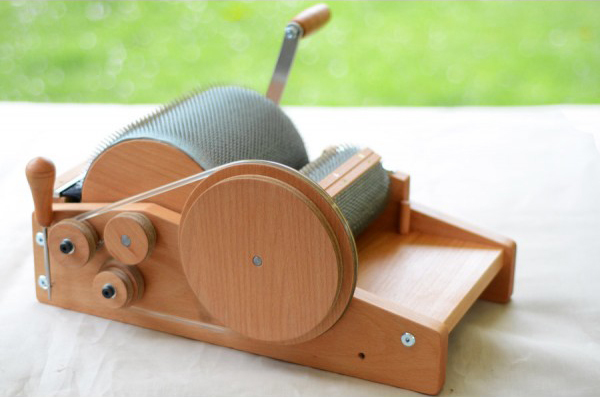 This ensures not only that you get a smooth action on the carder but also that there is minimal wear leading to misalignment of the drums. Handle made from heavy duty stainless steel with rotating wood grip. No plastic parts to break or fail. The packer brush locates on the frame at the back of the main drum, no clamping it sits on the frame. In this position it packs the fibres before they pass under the drum. This ensures any loose material placed on the top of the drum is pressed into place before it has chance to drop off. Doffer awl, designed to easily slide between the wire to lift out the fibre. We guarantee the frame and bearings for 10 years and the card cloth for 5 years of fair wear and tear. Fitting of any motor unit invalidates the guarantee. This type of machine is not designed for motorisation, mainly because of the safety aspect as there would be unguarded fast moving wire teeth. 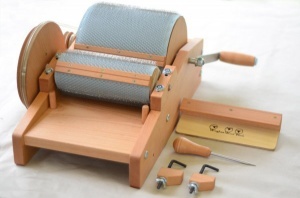 Drum Carders are carriage free to all UK destinations. Please inquire for export orders as we have good discounted shipping rates.